So I was headed north. In search of Polar Bears. In search of Roald Amundsen. 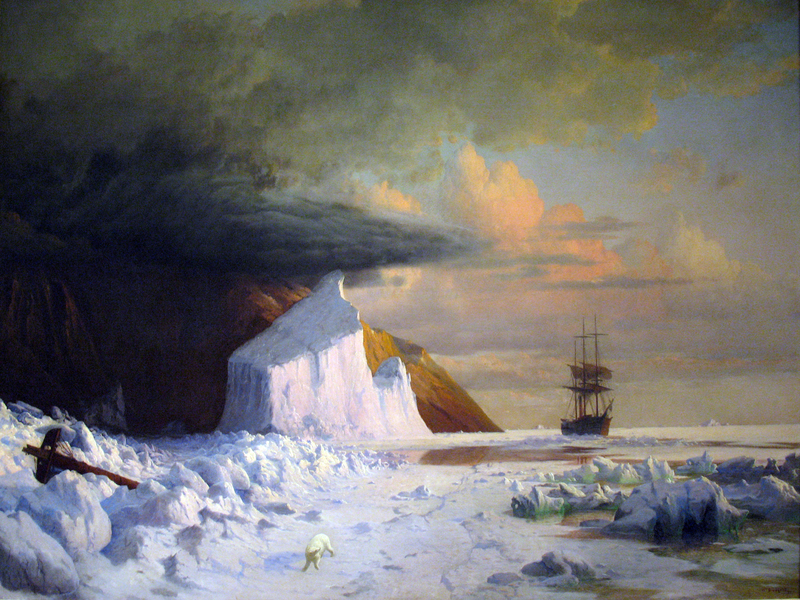 Lopez goes on to describe the destruction of ships in the pack ice, collapsing “like a grand piano caught in an industrial press” and “of a final image of devastation: the remnant of several whaling crews found in a frozen stupor behind a sea wall of dead bodies, stacked up to protect them from the worst of the heavy seas in which their small floe rolled and pitched.” Gruesome! This imminent threat haunted all who voyaged north, even in imagination. It was so much a part of the Ice that contemporary painters couldn’t imagine the ice without it. Frederic Church’s largest painting of his career originally lacked a human element, but after a poor reception at its first showing he added the cross-like wreckage in the foreground in the hope that it would add to its human appeal when shown in Europe. 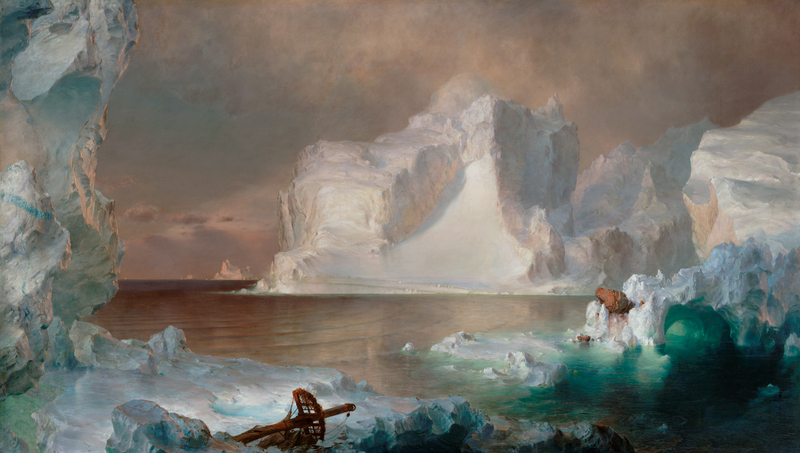 Ten years later that other master of Arctic light William Bradford added what appears to be the exact same element of foreboding and loss to his painting of Melville Bay. 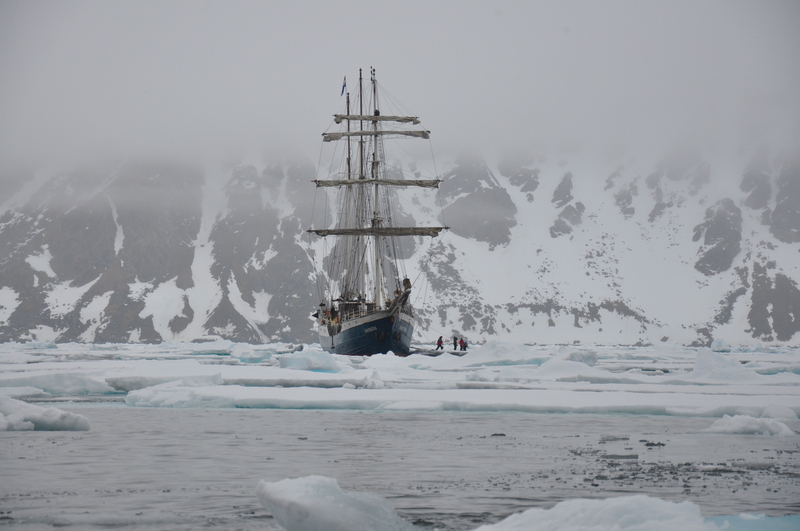 It came as no surprise then that when the Antigua sailed into the pack ice our captain was very wary. 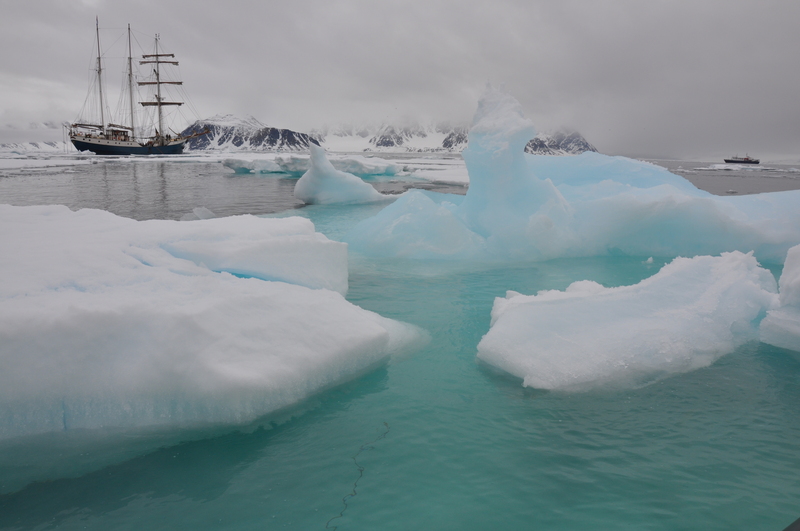 Antigua was only permitted to enter a ships length or two into the ice where we tied off to a large floe with ice anchors. Antigua, moored to the pack ice. 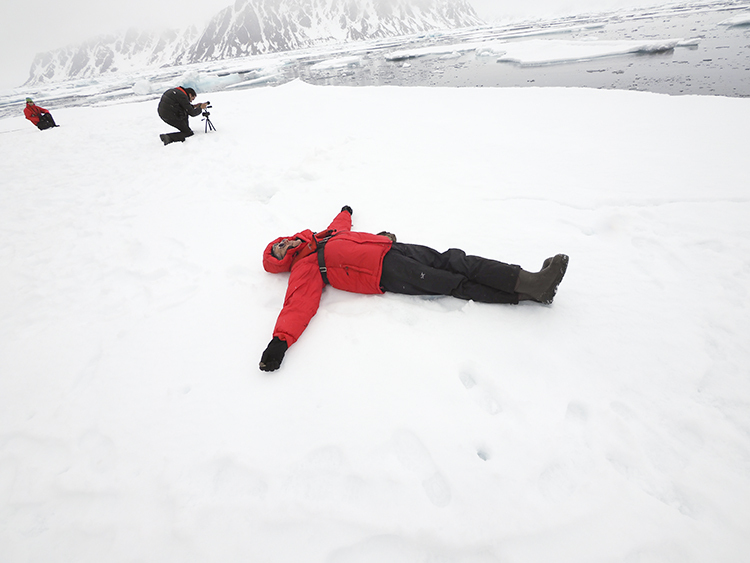 We were able to wander around on the floe (about the size my studio!) and savor the “enormous methodical beast”, while the guides kept a sharp eye out for polar bears who might surface nearby unexpectedly. Thankfully we were all kept safe. 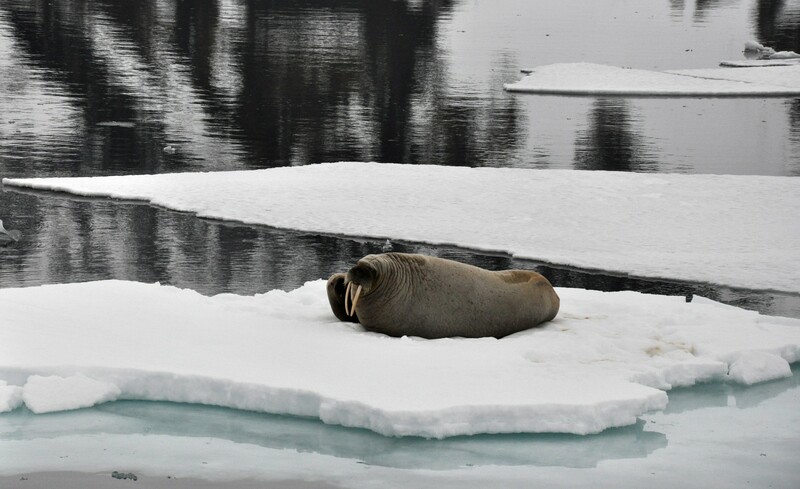 The only creatures we saw were some local walrus who were also taking advantage of the relative calm and safety of the floes. 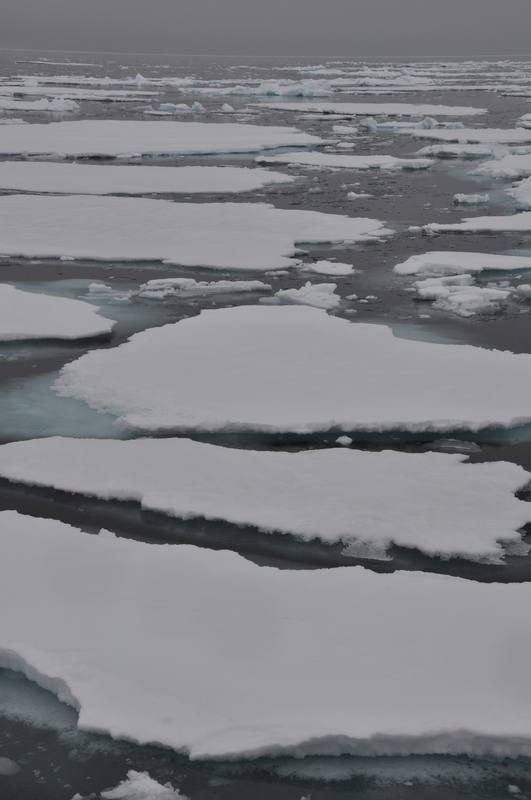 We were able to lower the two zodiacs and meander out through the leads in the pack to listen to the sounds of the ice grinding and melting (like deep frying chips) and to the sounds of harp seals navigating the soundscape under the ice. You can see my hydrophone in the foreground of this image and listen to a section from one recording to give you an impression. Can you hear the descending siren-like whistles of the seals behind the popping of melting ice and the motion of the floes in the waves? 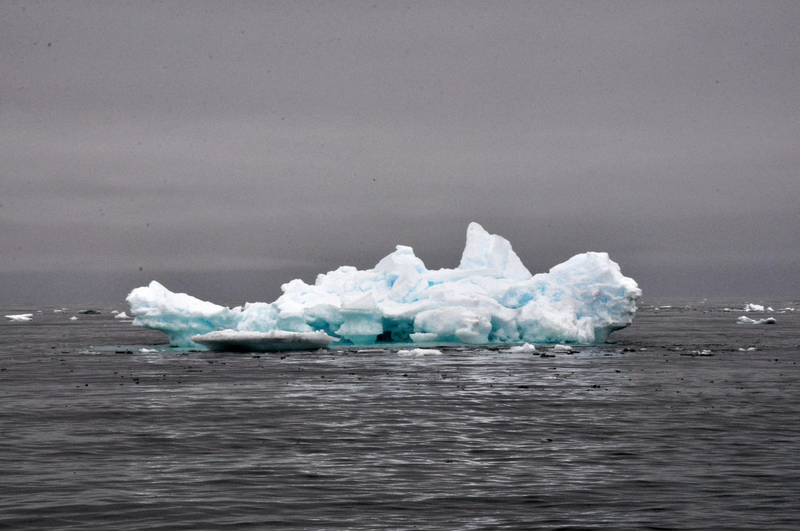 This marked the furthest north we reached on our voyage – 79º51 N 11º12 E.
Furthest North, at the edge of the pack ice! The captain only allowed us a single day of adventuring in the pack ice and then he set sail for safer waters further south. Here is a time-lapse recording of our 9 hour trip south to the safety of Trinityhamna in Magdalenafjord, accompanied by a recording from an accelerometer attached to the mainmast. Having done some armchair arctic exploration, I am really enjoying your journey and all the a/v and art. Thank you!